In the latest episode of PureMix's "Lifeboats" series, Andrew Scheps takes his turn at mixing the Will Knox song. In this excerpt, he discusses using his "Drums Dirt" bus, one of many parallel processing chains that are pre-configured in his mixing template. Because Drums Dirt works in parallel, it means that the processing doesn't take place directly on the drum tracks. Instead, it occurs on an aux track that's receiving the signals from the individual drum channels via aux sends. For this mix, he's sending the kick, snare, hats, tom and OH mic tracks to Drums Dirt. The distortion component in Drums Dirt is iZotope's Trash 2 plug-in. What makes parallel processing unique is that you typically process the audio quite heavily, but only bring in a bit of it alongside the original. In this case, the processing creates a thickly distorted drum sound, but by feathering it in with the clean drums, Scheps is able to precisely control how much grunge he’s adding. He plays back a section of the drums while listening only to the Drums Dirt bus. The sound is low-fi, crunchy and not something you'd want to use by itself. He explains that adding it into the mix gives the drums additional weight. If he decides to use it for this mix, Scheps says, it will only be on the chorus. He's tempted to try it there because there aren't a lot of sonic changes when the song transitions to the choruses. One of the keys to a good mix is to change things up to some degree from one section to the next, whether with instrumentation or processing. That can make the difference between a dynamic and captivating result and a static and boring one. What you don't see in this excerpt, is that Scheps gets the distortion for the Drums Dirt bus using the iZotope Trash 2 plug-in, which offers the user a lot of options, including multiband control. Inserted next in the chain is an Avid EQ with a broad and deep upper-midrange dip centered at 3.36kHz, which helps keep the cymbals out of this aggressive parallel process. If you're a PureMix Pro Member, you can learn more about Drums Dirt and all the secrets of Scheps' mix workflow and setup in the video "Andrew Scheps Mixing Template." Members can also download tracks from "Lifeboats" to create their own mixes. You can find out more about membership here. The EQ in Drums Dirt has a significant cut in the upper midrange. Next, in the excerpt, Scheps plays the same section of drums again, with both the clean drum tracks and the Drums Dirt bus on, and he mutes the latter in the middle to compare. He says Drums Dirt adds a little "ringiness" and length. After listening, he decides to turn down the kick-drum send feeding the Drums Dirt bus. He explains that he doesn't usually change the levels of individual drums going into a parallel bus. But in this case, although he likes what the processing is doing to the snare and overhead, he's not as happy with its effect on the kick, which is why he turns it down. After that, he's happy with the balance but mutes Drums Dirt for the time being. He says he'll try to build the mix without it and may or may not use it in the "Lifeboats" mix. You can create a similar effect to Scheps' Drums Dirt bus in your own DAW. It doesn't matter whether you're using individual drum tracks as Scheps did, or a stereo drum track or loop (although you do have more control with individual tracks). 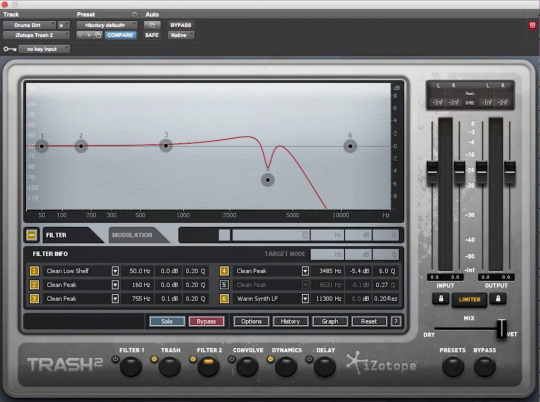 Scheps gets excellent results using iZotope Trash for the distortion, but there are plenty of other plug-ins you can substitute for it. 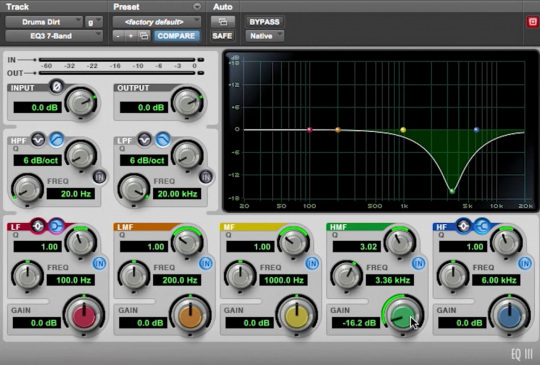 Most distortion plug-ins will work, especially those that can create extreme effects. 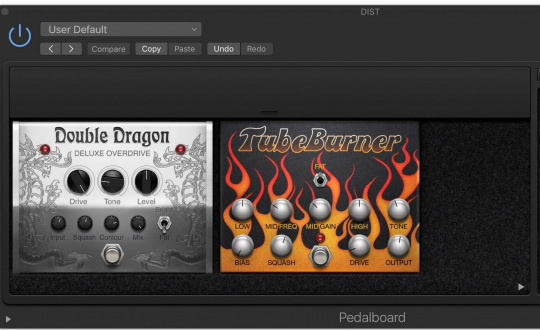 Example 1: This was created in Logic Pro X, using the Pedals plug-in with the Double Dragon Overdrive and Tube Burner Overdrive selected. Because the idea of the effect is to be distorted and lo-fi, you can use something like a guitar stompbox plug-in successfully. As with Scheps' Drum Dirt bus, this was applied in parallel. An EQ was inserted afterward, with a significant cut in the upper midrange, similar to what Scheps did. The first two measures of the example are the dry kit, on the second two the effect kicks in, and in the final two the effect is turned up higher. Example 2: Here, the effect is applied to give some energy to a dull-sounding sampled electric bass. Again, the first two bars have no effect, the second two have a small amount of it, and the third has a more substantial amount. The distortion for Examples 1-3 was created from Logic Pro X's Pedals plug-in featuring these two modules. Example 3: This time an electronic beat is processed with the distorted parallel effect. Like the previous example, the first two bars are dry, the second two have some of the effect; and in the third two have more. Because the snare has an almost "white-noise" sound to it, the distortion bus at its previous setting exaggerated it in an unpleasing way, so the center frequency of the cut in the EQ was moved from 5300Hz to 3600Hz, and some of the highs were rolled off on the overdrive effects. Another way to make not-so-exciting drums sound like they were recorded in a bigger room is to put reverb on them and compress the reverb heavily. Insert a room or chamber reverb on an aux send with a decay time between 1 and 1.5 sec. Insert a compressor after it, with a ratio of about 10:1 and low-enough threshold that you're getting around 10 dB or more of gain reduction. Set the attack to a fast setting and set the release long enough that the effect sustains until the next beat. Use the makeup gain to dial in more or less of the effect. 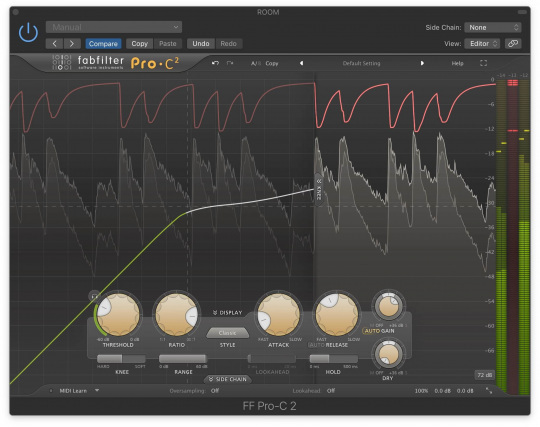 The compressor setting on FabFilter Pro C2, for example 4. Example 4: In this eight-measure example, the first two bars feature the loop by itself. In bar 3, a chamber reverb with a decay of 1.5 seconds comes in (it's Logic Pro's Chromaverb, inserted on an aux send). In bar 5, a FabFilter Pro C2 compressor, inserted after the reverb turns on; and in bar 7, the makeup gain of the Pro C2 is turned up about 2dB.